Last week, I met a friend for lunch in downtown Minneapolis. He suggested World Street Kitchen, a fabulous street food vendor that pops up in a different location every time you look for them and specializes in all sorts of food, typically with an African or Asian bent. 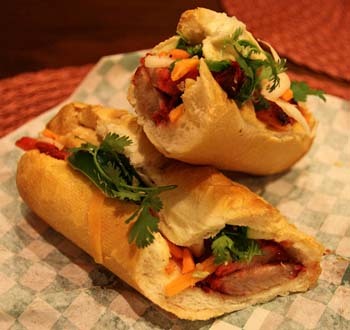 When I got there, I was mildly dismayed at the block-long line of bodies standing between me and my bánh mì, and I settled in for a long wait. The bánh mì, not because it has anything to do with this story, but because you're missing out if you don't know what I'm talking about. Go find one, immediately. But, to my surprise, I was at the front of the line placing my order before I even had time to wonder if pâté was available. And when I took my credit card out of my wallet, I immediately found out why. The person inside the cart was just making the food and taking the orders—the payments were going through the gentleman standing near the counter gesturing at me with an iPhone and stylus. He swiped my card on the side of his phone, I signed my name on the touchscreen with the stylus (and was even able to add a tip in the tip line), and our time together was done. The reason for this miracle of modern street food is the existence and growing popularity of the mobile credit card reader. While this isn’t new technology by any means—smartphone-owning entrepreneurs have been operating this way for a few years now—the booming market has given rise to a multitude of options. Simply download any of the wide variety of apps and get started. Why are mobile credit card readers so important to small businesses? Accessibility. Wherever your consumers are, wherever you might connect with them, you need to be able to make a sale on the spot or you’re missing out on opportunities. The hardware: Square will mail you the small, white, square iPhone attachment at no cost upon signup. The software: Apps are available from Apple, Android, and Blackberry devices. The hardware: A half-circle affixes to the top of your phone. The software: MerchantAnywhere is compatible with the big three, as well as Palm and Windows smartphones. It’s hard enough for a small business to find sales. Don’t let them walk away from your small business because you weren’t prepared for them. ‹ It’s Time To Start Your Own Business. Everything is very open with a very clear description of the challenges. It was truly informative. Your website is useful. Thank you for sharing! Click&Inc vs. Competitors: How Do We Stack Up?